The natural Talalay latex Rejuvenite pillow is made from 100% natural Talalay latex. Natural latex is extracted from rubber trees and is manufactured using the environmentally friendly Talalay process. The natural Talalay latex Rejuvenite pillow is made from 100% natural Talalay latex. This means that natural latex is sustainably extracted from rubber trees and is manufactured using the environmentally friendly Talalay process. 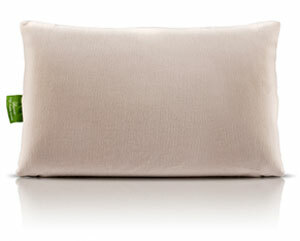 The Rejuvenite Pillow also comes with a removable organic cotton and poly blended cover. The production process uses only natural, biodegradable ingredients that come from renewable resources. 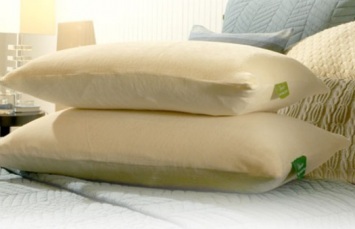 The pillows luxuriously plush feel is due to it’s unique pin-hole design and open cell structure which provides enhanced air circulation making the pillow cooler in the summer and warmer in the winter. Low Profile: Design also offers a softer feel for stomach and back sleepers. High Profile: Design supports the head and neck and contours to support side and back sleepers. Along with the eco-friendly production process, this pillow features eco-friendly packaging made out of natural materials like jute, hemp, and cotton. The information sheets are even printed on recycled paper using soy inks from a wind-powered printing press!